Low level laser therapy utilizes photons of light to stimulate the mitochondria or power houses of the body's cells to create more Adenosine Tri-phospate or ATP. ATP is the main molecule involved in creating, transferring and using energy in the body. The more ATP that is available, the quicker the body's cells can regenerate and heal. Laser therapy can speed the healing process and reduce the amount of down time after an injury. Graston Technique is a soft tissue modality used to help break up adhesions or scar tissue that develops after an injury. Scar tissue can form in the muscles and ligaments after an injury. Many people benefit from Graston Technique, from rotator cuff injuries to whiplash. Ask Dr. Akita if Graston is right for you. Kinesio tape is a type of elastic tape that is placed along muscles, ligaments and tendons to give support and strength to an injured area. The tape can also provide neuromuscular feedback allowing the practicioner to facilitate or inhibit a particular muscle. 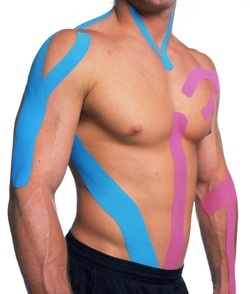 Elastic taping is very popular with athletes as it allows them to have the advantages of taping without the cumbersome weight of traditional athletic tape. You can often see this type of tape used on professional atheletes and olympians.